R 432.21402 Principal officer responsibilities. funds derived from the licensed gaming event. terms of probation, and directives of the bureau. (c) Ensuring that all records related to the licensed gaming event are current and accurate. (d) Reviewing all reports and correspondence from the bureau. to the bureau as prescribed by R 432.21420. (f) Responding in writing to violation notices as prescribed by R 432.21106. R 432.21403 Millionaire party chairperson; qualifications and duties. act, these rules, terms of probation, and directives of the bureau. (3) The chairperson shall be listed on the license application. (5) The chairperson shall be present on the premises continuously during the occasion. money derived from the conduct of the licensed gaming event. by the principal officer of the qualified organization. conduct of the licensed gaming event. distribute any kind of millionaire party equipment. game tickets, or numeral game tickets. R 432.21405 Raffles, charity game tickets, and numeral game tickets. prescribed by R 432.21501 to R 432.21522. R 432.21406 Equipment and games. Rule 406. (1) Only authorized equipment and games may be used at a millionaire party. repair and sound working condition. the bureau based on the best interest of the public welfare. (c) Dice games where players compete only against the licensee. (e) Card games approved in writing by the bureau. (f) Any other equipment or games approved in writing by the bureau. (6) In all dice games, the size of the dice shall be not less than 3/4 inch. for the use of equipment or for any other reason. other than those times stated on the license. the licensed gaming event, except as approved in writing by the bureau. (c) The price of imitation money or chips and admission fee, if any. (f) The method of play for all millionaire party games to be conducted. (g) The statutory limit for total prizes or winnings awarded to a single person in a single day. (h) The bet limit for all games. (i) The effective date of the house rules. (a) The limit to the number of hands a player may play. (b) The method by which the winners will be determined and the raffle will be conducted. (c) The redemption claim period for charity game tickets as prescribed by R 432.21611(1)(c). (d) The redemption claim period for numeral game tickets as prescribed by R 432.21709(1)(e). sufficient number for distribution to all interested persons. (4) The house rules shall not be in conflict with the act, these rules, or directives of the bureau. R 432.21408 Imitation money and chips. charity game tickets, numeral game tickets, non-gaming items, or tipping. (3) Imitation money or chips shall only be sold by authorized sellers. (4) Imitation money or chips shall not be sold by dealers or at individual gaming tables. (6) A player shall only redeem imitation money or chips that they have purchased or won. (7) Imitation money or chips shall only be redeemed at authorized redemption areas. R 432.21409 Millionaire party conduct. Rule 409. (1) Millionaire parties shall only be conducted between the hours of 8 a.m. and 2 a.m.
license, except for disputed prizes. (6) A wager shall not be placed on an athletic event or a game involving personal skill. taking place at the location within the hours stated on the license. dealer or operator shall touch the dice. boards, then the roll is void and the dice shall be rolled again. 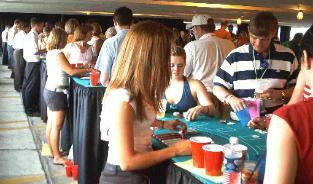 (4) In blackjack, the dealer shall draw on 16 and under and stand on 17 and over. (5) There shall not be more than 7 players at a blackjack table. R 432.21411 Personal limitation on winnings. imitation money or chips purchased during the occasion. Rule 412. (1) At least 50% of all workers shall be members or spouses of members of the licensee. licensee that is conducting the licensed gaming event. (5) A worker shall not split a prize with a player or accept tips of any kind. Rule 413. (1) The commissioner shall establish a service compensation schedule for workers. the service compensation schedule, except as prescribed by R 432.21517.
exceed $50.00 for his or her services for each day of the licensed gaming event worked. per day of the licensed gaming event. limit per occasion as prescribed by this rule. receive food and beverages consumed while working that do not exceed $5.00 in retail value. gaming event or as directed in writing by the bureau. licensed gaming event or the financial account as prescribed by R 432.21415. (12) All compensation shall be reported on the financial statement as prescribed by R 432.21420. R 432.21414 Game records; retention. forms prescribed by the bureau. (2) Game records shall include a copy of the current license application and any changes. least the current calendar year plus 3 years or as directed in writing by the bureau. on site at the occasion to authorized representatives of the bureau for review. authorized representatives of the bureau for review. raffle tickets, charity game tickets, and numeral game tickets. devoted exclusively to the lawful purposes of the qualified organization. transferred shall be open for review by authorized representatives of the bureau. event shall be necessary and reasonable. (a) Each check shall be preprinted with the name of the licensee. (b) The check shall be signed by an authorized person or persons. (d) A check shall not be made payable to cash or bearer and shall not be drawn in blank. (e) The check shall contain a brief description of the expense on the memo line. done in accordance with directives of the bureau. upon request by the bureau. (9) Checks shall not be cashed out of the millionaire party start cash or gross revenue. by check as prescribed by this rule. R 432.21416 Rent and rental location agreement. conditions of rental, including the fee, are in a written agreement approved by the bureau. (2) A location shall not be rented by a licensee on a percentage basis. party and that worker shall be eligible for pay as a worker as prescribed by R 432.21413(4)(b). subrule shall not assist in the operation of the millionaire party in any other capacity. event, except as prescribed by this rule. (3) Advertising is permitted by any legal means. (4) Expenditures for advertising the licensed gaming event shall be necessary and reasonable. (c) The purpose for which the net proceeds will be used. (d) The personal limitation on winnings as prescribed by the act. R 432.21419 Millionaire party financial records; retention. (a) A copy of the financial statement as prescribed by R 432.21420. (b) Bank validated deposit slips for all proceeds from the licensed gaming event. accounts where proceeds from the licensed gaming event were deposited or transferred. R 432.21420 Financial statement requirements. the month that the licensed gaming event was held. of his or her knowledge.